THE EDITOR: (I had 10 different readers for commentary, five who knew me and five who didn’t know me or the subject matter, compiled all considerations, and then did the final editing myself – you don’t need to mention this – I highly encourage authors to get professional editing, I just wanted a wider perspective than one or two editors could give). THE PUBLISHER: Adirondack Press, Inc. (AdirondackPress.com). Books for inter-dimensional people, Manifesting spiritual concepts in the world. Adirondack Press helps people get their stories ready for publication into print and electronic format. The “Legacy Books” specialty handles all sizes and kinds of manuscripts, can transcribe into text from taped interviews (and will even conduct the interviews), can transfer handwritten or typed manuscripts into electronic format to archive, share, submit for publication or take to print. SUMMARY: This is a story about my training and first several years serving in a discipline called “Reiki” which was brought out of Japan into the United States just before World War II. I started my journey in 1985, mentored by the first Master on the East Coast. By that time there were training “ intensives” which offered instruction in Aikido to train the mind as well as the body, calligraphy for Japanese kanji and symbols, council training – learning to be present to actually listen and observe, practice in the hands-on art of Reiki healing, and other rounded approaches to the concept of Mastery – a way of being, a path walked every day, not merely an accreditation or a credential. The concept of personal mastery fascinated me. I ended up selling my business so I could teach Reiki, personal empowerment and Mastery to others. There were just over 500 teaching Masters in the world the year I was initiated as the first Master in New York State. Reiki was just beginning an explosion into the world, and I found myself teaching in Alaska, Hawaii, the UK, Holland, France, Trinidad and Tobago, Bali, Indonesia and Nepal to name a few. I was the first Master to bring Reiki into leper communities and AIDS centers (The Living Room in Cleveland and the Globe Center in London) with the bottom line of, “It works – I’m a practical woman, and if it didn’t work, I wouldn’t be doing it.” Hands-on, language differences really didn’t matter, my students and I found interpreters everywhere we went when we needed them. It was magical watching things come together. THE BACK STORY: The training I experienced is no longer available as such – I really wanted to document the journey into personal empowerment and Mastery – I felt it was a gift beyond measure, and one I’ve been able to share with my students and initiates. I remember when and how my thinking changed from one concept to another, what triggered deeper, expanded understanding and different, more encompassing perspectives – these things were so precious to me that I really wanted to share them with others. When the time to write the book came (meaning, when I couldn’t think about anything else!) I took a summer off from traveling, sat down at my kitchen table with my old computer, and wrote steadily for 6 weeks. Then came researching and documenting the details, getting permission from different people, asking a talented friend to do the illustrations, and rewriting: the book seemed to dictate its own order, and it “told” me when it was done – it didn’t want the other three chapters I had already written – they re set aside for a sequel! Then I sent the hard copy manuscript out to different readers for their comments (with different colored pens and return posatage). A couple of rewrites later, with cover art and illustrations completed, we went to print. One thing I did learn about writing is that you had better like what you write, you will be reading it a LOT in the editing process! WHY THIS TITLE? 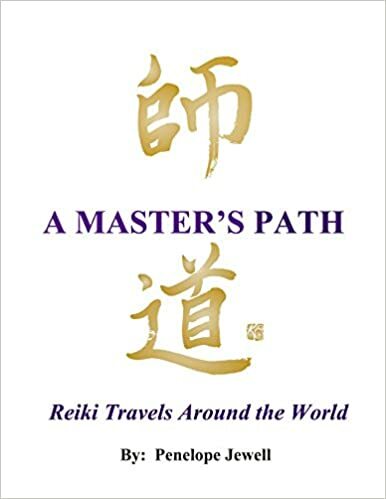 : A Master’s Path is the life-changing journey I ended up living, when I took the apprenticeship and training to become a Teaching Master of Reiki. It is a journey anyone can take. WHY WOULD SOMEONE WANT TO READ IT? I never knew there was a way of life that required me to recognize and act upon what was true for me – rather than what I had been taught was “true” – those pre-set rules of the road that are supposed to keep you safe and happy. I ended up teaching “self-empowerment” workshops, separate from my Reiki classes, for many years – what I found was that Reiki was a first step in self-healing AND self-empowerment, and supported an individual being congruent with their own inner truth – each person’s perspective is unique and valid and an integral part of the Universe “unfolding as it should” – and that is profound. LOCAL OUTLETS: Any bookstore can order this book for you, or you can get it from AdirondackPress.com. A Master’s Path is now available in all e-book formats. WHERE ELSE TO BUY IT: Amazon.com, the world’s greatest bookstore online, and all e-book sellers.